The Halfway War – Israel and Gaza | Armchair General Magazine - We Put YOU in Command! The misery should not be disproportionate to the value of the results. When a rule-of-law democracy embarks upon a military campaign its leaders are not committed to pressing to a decisive conclusion, it upsets the ethical calculus. In war, worthy ends can justify ruthless means. But a feckless, inconclusive application of military force that does not produce an improved post-war environment is difficult to justify. After enduring years of terrorist rocket attacks from Gaza, followed by Hamas’s one-sided abrogation of an extended-truce proposal, Israel acted in self-defense. The initial cause of this three-week war was just. The subsequent application of heavy, but discriminate, firepower by Israel in dense urban warrens in which Hamas employed non-combatants not only as human shields, but as propaganda sacrifices, was also justified—but only if Israel meant business and intended to continue operations until Hamas was shattered and its senior leadership cadres had been killed or captured. Stopping short of the campaign’s logical goals abruptly calls into question the level of destruction and civilian deaths. Collateral damage can only be excused when the end attained is greater than the cost. For example, the relentless bombing campaign against the cities of Nazi Germany was justified as part of a total effort to eliminate Hitler and his regime. But the massive loss of civilian life would not have been acceptable had the Allies agreed to a peace that left the Nazis in power. In war, you may do evil to achieve a greater good, but not without a transcendent moral purpose. Likewise, the employment of fire-bombing and, ultimately, of atomic bombs against Japanese cities was morally acceptable because of the stakes involved, previous Japanese behavior, and the potential for a far greater loss of life (on all sides) were we forced to invade Japan’s home islands. But a premature peace that accepted a continuation of the militarist regime in Tokyo would have reduced our behavior to wantonness. The end not only can justify the means, but must. In the conduct of war, the innocent will always suffer, no matter how scrupulous targeting cells and decision-makers may be. But the misery should not be disproportionate to the value of the results. The paradox isn’t that Israel caused too many casualties, but that it failed to continue killing Hamas terrorists until the civilian casualties could be justified by the war’s results. With 1,300 Palestinians dead (most of them Hamas terrorists, but not all) and zones of severe damage within the Gaza Strip, Israel has betrayed its own morality by letting Hamas survive. When the IDF unilaterally ceased fighting on the weekend before the U.S. presidential inauguration, the terrorist leaders, who had hidden in deep Iranian-engineered bunkers under hospitals and schools, had only to emerge into the light of day as survivors to declare themselves the victors. Life isn’t fair, and neither is war—especially the challenge of fighting faith-fueled terrorists. To win, we have to kill enough of them to destroy their organization and break the will of any survivors. The terrorists only need to survive in sufficient numbers to pop back up and thumb their noses. Yet, the necessity of killing terrorist leadership cadres in large numbers is a lesson Western states, including Israel, have difficulty absorbing and remembering. From a diplomatic standpoint, Israel did have multiple justifications for stopping short. Hamas had received a significant drubbing and a local humiliation. The Olmert government had timed the operation to exploit the remaining weeks of the Bush administration and, with the inauguration of President Obama looming, the Israeli “triumvirate” of Prime Minister Ehud Olmert, Foreign Minister Tzipi Livni and Defense Minister Ehud Barak (the latter a decorated war hero) decided it could not afford to appear as the prime mover in the first foreign-policy crisis facing the new U.S. administration. With President Obama a worrisome unknown to Tel Aviv and Jerusalem, the Israelis decided not to risk a public repudiation from Washington. Israel also faced the inevitability of significant greater casualties—friendly, enemy and civilian—if the IDF were ordered to penetrate to the heart of Gaza’s cities. And, contrary to anti-Israeli myths, Israel is ever cognizant of the human cost of war. Additionally, the global media and anti-Israeli regimes around the world were screaming, exaggerating the carnage in Gaza and ignoring the fact that all Hamas had to do on any given day to stop the fighting was to stop firing blind terror-rockets into Israel and agree to live in peace. While Israeli leaders should have learned by now that their only hope of achieving a durable success in the course of a conflict is to ignore the media, the UN and other terrorist fellow travelers until the job is done, the Olmert government lost its nerve again. What will emerge as the smoke of battle clears? Perhaps the hammering Hamas received will have chastened the terrorist organization and, despite the current crowing, might have weakened it sufficiently to loosen its death-grip on the Gaza Strip. But the odds are better that Hamas will be able to maintain its local monopoly on violence against its own people and, with the assistance of a multitude of international aid organizations, return to employing aid as an internal political weapon while renewing the smuggling of Iranian-supplied armaments. While we can’t yet know which trend will emerge the stronger, the odds are that nothing will have been decided by this halfway mini-war. While Israel has set back Hamas’s development of a full-blown second front to complement Hezbollah’s primary front in southern Lebanon, it left Iran’s proxies alive to proclaim themselves resistance heroes. Israel’s unwillingness to do all that was required to crush Hamas also may have encouraged Iran to intensify its nuclear-weapons program, assured that Israel lacks the guts and wherewithal to stop it. A half-fought war—that bizarre vice of democracies—doesn’t save lives in the long run, but guarantees a future round of violence—probably with higher stakes and definitely with greater ferocity. In stopping short of its essential goals, Israel broke a fundamental rule of all warfare: He who is unwilling to pay the butcher’s bill promptly will pay it with compound interest in the end. 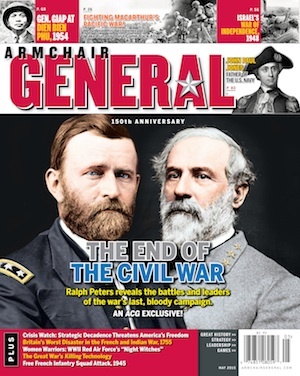 Ralph Peters is a long-time member of the Armchair General team. A retired Army officer, strategist and columnist, he’s the author of 24 books, including the recent Looking For Trouble and Wars Of Blood And Faith. You say that the campaign’s “logical goals” were to shatter Hamas and capture or kill its senior leadership. Yet none of Israel’s leaders went on record as saying that was their actual goal, and for good reason: the political realities of today’s Middle East render a black-and-white “total victory” view of war obsolete. That’s why I don’t think your WWII analogies work at all. The leaders that won WWII were alive during — and could actually remember — a civilized, liberal Germany before the war, and a Westernized Japan that was our ally in WWI. The Allies knew if they obliterated the Axis military/political systems, they could get the Axis citizens back to the way they were. Therefore it was logical to demand unconditional surrender. There is no such corollary memory of a Westernized, enlightened Palestine to revert back to. And the Palestinians will never again allow the easy occupation Israel enjoyed from 1967-1987. Even though I agree with your assessment of Israel’s ability (at great cost) to obliterate Hamas’s leadership, you don’t answer: What then? Israel cannot simply remove Hamas, march Fatah into Gaza, and install them as the new government. I think a better analogy would be to the Vietnam War, where no matter how many Vietcong or North Vietnamese soldiers the U.S. killed, they just kept coming. Why? Because they perceived their fight to be a war of national liberation; the civilian population supported them (while rejecting puppet governments); other major states provided cover and materiel; and the only solution was political. This does not justify the despicable tactics of Palestinian terrorists over the past 40+ year, but the point is that the solution is political. And like the difference between WWII and Vietnam, your moral justifications for overwhelming firepower in support of a righteous cause become a lot murkier once it is clear the ultimate solution is a political rather than military solution. (Though even about WWII, your assertion that all bombing was justified ignores the still-lingering ethical debates.) The “What if” scenarios about plots to kill Hitler are so enthralling because there’s general agreement that National Socialism dies with him; in today’s Middle East, radical Islam, hatred of Israel, and calls for its destruction are deeply ingrained in a large percentage of the population and are not going away regardless of who Israel captures or kills. Politically, I believe Israel’s leaders think that a punishing “mini-war” will turn the Gaza population against Hamas and force them out of power the same way they came in, through the ballot box. Time will tell if that will work (I doubt it). The STATED war goal of Israel was to stop the rocket fire from Hamas. Again, time will tell, but this seems more likely. There is general consensus that the 2006 Hezbollah War was a fiasco for Israel, and yet — save for a few stray rockets during the end of this last war — the northern border has been quiet for nearly three years. Israel may have bought itself a period of quiet in the south now too, but needs to brandish as big a carrot with the moderate Palestinians as the stick they wield with the radicals if there is any hope at all for a lasting peace. The article claims that this was a “just war.” but yet makes no mention of Israel’s 40 year occupation of the Palestinians or the fact that Israel has turned Gaza into a concentration. It’s so bad in Gaza that people have to smuggle in milk and other food products through smuggling. This wasn’t no fair two countries with armies fighting each other. The entire Palestinian population are civilians. Not even the Nazi’s occupied any neighboring country for more than a few years. Jeez what a comparison LOL. Omar you know why the Nazis didn’t occupy anything for more than a few years: the Western Allies and the Soviet Union fought a war against their aggression. They didn’t have a choice. On a more intellectual light, I agree absolutely neally entirely with Paul. My short comings are that I don’t know enough to be able to critically think and anaylse all the aspects of the issue, but I found myself nodding in agreement with Paul’s points. Indeed, a political agreement is needed, but it is unlikely that one will be reached. This could almost be classed as a cultural war, if such a thing can exist, because of the conflicts in history between Israel and its Middle Eastern neighbours. The architects of the Jewish state are too blame for their short sightedness I believe and that in reality neither side are too blame for the current mess, to an extent. Despite what I’ve mentioned above, I don’t think the blockade and the conditions imposed on Gaza by Israel are fair and are ridiculous if they are believe a peace can be reached while they are maintained. That said, I don’t agree with Hamas campaign against Israel but because of Israel’s action in the last few weeks and in the past, their cause can be easily justified in the eyes of oppressed people. If Israeli military and political analysts think bombing for votes will work they are blind by the reality they are attempting to reach a peace within. As Paul mentioned, and supported with his point of America’s war in Vietnam, only a political agreement can reach some sort of peace, but given Israel’s stance as well some Middle Eastern fanatics demanding destruction of Israel it is not likely a peace will ever be reached. It’s (the conflicts between Israel and it’s Middle Eastern neighbours) been going for neally 60 years in modern times and there appears to be no end in sight. I think there are several flaws with this report. The first is to claim that deaths by war can be justified if the conditions that arise post-war will preserve more lives in the long run. Let’s call this the “war saves lives” argument. I believe it is a false claim because right and wrong are not considered. Imagine, for, instance that many lives would have been spared if Nazi Germany had been appeased (the scores of millions of World War 2 would not have perished) – the “only” victims would have been 7 million Jews and maybe 2-3 million other people. If something like this were to happen, one following the original mantra of “war saves lives” would not object to the violent oppression and extermination of minorities (assume, for simplicity that Nazi Germany would not have expanded or otherwise behaved aggressively after claiming Danzig and no other victims would have been claimed). I think we can agree that such an attitude is erroneous as it does not consider who is right or wrong in a conflict; we just imagine how many lives can be spared in the long run. Considering that more than 400 victims were children (and presumably innocent) claiming that most (meaning over 650 out of 900) were terrorists is dubious at best (please name a source if you want to contest this). The follow up talk of “terrorists” ignores that the Gaza refugees have democratically elected Hamas, have seen their lands (to which they hold deeds from the British mandate times) being usurped by Israeli settlers and live in conditions of extreme poverty, misery and frequent deaths. Calling them terrorists is unfair because they are fighting a war against an aggressor (remember resolutions 242 and 338 of the security council of the UN?) that has driven them out of their land and now claims it as its own. For exiles living in misery to turn to radicalism is not unheard of nor unexpected. I feel that even if all the Hamas leadership were to be destroyed, another radical organisation would take its place. The reason is, of course, that misery, poverty and oppression are the breeding grounds of extremism (regardless of religion, which in times of prosperity becomes more and more irrelevant). Perhaps some feel that the only hope for lasting stability (through the aggression path) is for the IDF to break the will of the Palestinian people to fight by inflicting terrible civilian losses (by direct annihilation of people or severe destruction of infrastructure). I feel that such actions should not be acceptable. And for the record, I don’t think that the other side is not to blame. But claiming that the conflict is a binary moral affair (one side right – the other wrong) is patently false. I agree with the author’s take on the situation now that Cast Lead has been halted. First, let me say that Israel have wronged the people of Gaza and the West Bank for years. I, as an Israeli would be the first to admit it. the (Oslo Agreement) Autonomacy granted, gradually since 1994, was overdue by years and years. Having said that, as one side of the eqation did their best to start a more peaceful life, the other (who shall remain nameless…) was busy coordinating suicide attacks and storing weapons, instead of directing their resources to building a sustainable goverment and raising their people to flurishing indepenence. My disagreement is with this: This war was not even started by Israel, but by the Hammas ! the ” Cast Lead ” operation was simply an offensive designed to shift the balance of powers(temporarily only, I am sure) and bring in some more international pressure into the mix to slow down Hammas’s plans. Soon enough, I fear, another offensive will be necessary. The Mongols wiped out the Assassins and their bases and the latter survive as Ismaelis supporting the Aga Khan. The British wiped out the Thugees root and branch and killed many Indians who supported the burning of widows on their husbands’ pyres. How else do you deal with a murderous enemy? The difficulty is that Israel has an ethical basis that is susceptible to a hostile western deology that castigates its very existence. We would all be happy if the emerging Palestinian national identity accepts the UN division of Palestine into two states and the two entities can argue peacefuly for their respective shares of the land. Last comment: beware false analogies. We are dealing with killers holding their own people hostage and sooting at women and children across an artificial border. Peters misses part of the problem. Hamas deispersed to avoid the Israeli attack, so lengthening the attack would accomplish nothing but increasing civlian casualties and the economic costs of mobilization. The only policy which could accomplish anything would be the reoccupation of Gaza. Combining this with a sensible occupation policy (no settlers, providing public services, encouraging economic ties). This would result in more Israeli casualties in the short run, but in the long run it would bring peace & stability. One may conclude that people who say that the “end justifies the means “have never been on the losing end of such a conflict. They’ve never had to collect the body parts of their spouse and bury them. They’ve never smelled the bodies of their relatives as they burned with white phosporous. They’ve never held their chidren , as they lay dying from bullet wounds. Forty years of occupation failed to accomplish two things. One would be peaceful accommodation; the Palestinians don’t want to make peace, and outside of Israel the bordering states don’t want peace either. A two state peace is best for Israel as well as the citizens of what would be a Palestinian state, but Iran and Syria would lose their catspaws and the focus for their own opressed peoples. Without the refugees, who do the Mullahs and Kings point to to show their own subjects just how much off they are? Second cause of occupation failing to create a stable environment is Israel’s tentative, creeping annexation of the occupied territories. I mean, forty years of “stewardship” without a resolution of the status of the territories? True, the denizens of the territories did develop economic ties with Israel, but there was no permanence to their arrangements, no incremental assimilation of the populace. Instead, Israel and the other states bordering the territories kept the camps and the refugees bottled up. While Israel was slowly building into the territories – annexing a bit at a time, in effect – she was also providing trade and employment opportunities to refugees, and much of the social services made available to the camps. The real obstacles to a resolution of the status of the territories lie in the UN, where states governed by dictators regularly condemn Israel for everything under the sun, and with the bordering Arab states, which have made the refugees victims of their own ambitions as they have since 1948. If the Arab states opened their territorial borders open and offered the refugees citizenship today, the Palestinian problem would be over tomorrow. A number of factual inaccuracies in this article are sufficient cause to doubt the overall conclusions. 1. ‘Most’ casualties were Hamas fighters. When UN sources have nearly 50% listed as civilian casualties, this is dubious at best. and failed to do so. The immediate cause of the breach was an IDF raid into Gaza. As israel can hardly be expected to tolerate the continued rocket attacks into Sderot, so Gaza can hardly be expected to tolerate IDF attacks that re little better than extra-judicial executions. The whole article in fcat reads like it was penned by an IDF spokesman. RE: Factual Errors. Doug, please do a little research. 1. The UN has been shown to be active promoters of Hamas propaganda – shouldn’t we be a bit suspicious of their numbers? The IDF numbers deaths at under 1000, but I’d wait for independent confirmation for that as well. Remember that the UN condemned the Jenin massacre based on the propaganda of the Palestinians too. 2. Nice: blame Israel for breaching a ceasefire that Hamas never observed – they allowed 329 terror attacks (mortar or rocket) against Israeli civilians in the prior 6 months. Nope, must have been Israel’s one raid that “breached” the ceasefire. Your whole post in fact reads like it was penned in your mother’s basement while wearing your solidarity kaffieh and reading from the “Junior Terrorist Wannabe Jew-Baiter” handbook. Get a life and read some facts, Doug. The whole ‘Ends Justifies the Means’ argument is quite frankly disgusting. Ralph Peters compares Israel’s attack on Gazas civilians as something akin to the bombings of Nazi Germany and Imperial Japan during WWII–shame on you Ralph Peters. The bombings of Hamburg, Tokyo, Dresden and the other cities were nothing short of acts of terrorism–especially Dresden–and I find it interesting, Mr. Peters, that, although you comment on the attacks against the Palestinian civilians as a way to get them AGAINST the elected Hamas government, you mention NOTHING of the fact that not only did the bombings of those German cities draw the people CLOSER to ‘Their Fuhrer’ and the Nazi regime, but it also: 1–Made the Wehrmacht fight MUCH harder then the allies were prepared for, and 2-made no, I repeat, NO difference against the German industry that it was SUPPOSED to be targeting: in fact, the German industry pumped out MORE Panzers, fighter and guns–and everything else–then it ever did in the first years of the war. Ummm, that’s a lie: first off, Gaza, much of the Middle East and basically the rest of the civilized world have long since been ready to agree on a two state system based on Israels’ 1968 desires. It’s only Israel and the US who refuse to end this nightmare (BTW, you do remember that Israel’s been blockading Gaza for the last few years, yes?). Second, the rest of the world aren’t exaggerating the carnage in Gaza when it turns out that 400+ children were killed in the conflict (unless you mean to say they were some of those ‘mostly Hamas fighters’ whom you were talking about the IDF killing) And, BTW, the IDF doing a great job there–AGAINST WHO! Like Israel with its US-made attack choppers, Merkava tanks and highly trained soldiers were going to have A PROBLEM fighting against people using homemade rockets and…what…STICKS!? Some AKs. The Russian army could have done just as well there–and THEY had trouble fighting the Georgians! The fact that people all over the world, including this country, have been demonstrating on mass AGAINST what Israel has done (yes, even in the USA–where’s THAT on CNN?) goes far more to tell me that Israel–this time–went too far then your words can convince me they were right in what they had done. That fact the even jews–JEWS–in large numbers have condemned Israel’s actions carries much more weight then some nut job who says what you have (And stop making excuses for Israel’s early pull out, even they knew what they were doing was pushing the line, why else wouldn’t they have–as I said–said, ‘The hell with world opinion’ if they were so ‘justified’ in their actions. Israel has done the absolute worse thing that could have been done in that volatile region: they attacked a people whom they had locked up in a modern day ghetto, killed more civilians then any fighters AND WORSE, they couldn’t even get the job done: not only is Hamas still in power, but the tunnels the IDF were going after were back up and running the next day. Israel really blew it in this one; the truth will come out, and if it’s what I’m suspecting, it will not shine a pretty light on Israel. BUT, ISRAEL were the ones who fired the first shots and not the other way around. BUT, they were ELECTED into power (this is the US’s main problem with the whole spreading democracy around the world thing: sometimes the guy(s) that WE want to take power are not the guy(s) the PEOPLE want to take power). BUT, it does not have the right to basically pummel a people who are mostly poor, hungry and suffering; a people whom the world is prevented from helping by Israels blockade (which, IMO, was the TRUE ‘first shot’ of this conflict). Israel made this problem themselves, they tried to solve it in that brief moment when they thought no one would be looking. Well, they were wrong: not only was the world looking, but it may have seen the truth. First of as noted by others the author is on very shaky ground when he speaks about the bombing of Dresden and other german cities as well as the atomic bombing of Japan of being morally justified. Cynically, of course, “all is fair in Love and War” but morally there is no justification for incenerating hundreds of thousands of civilians. If anyone doubts that, just let them think about how they would feel if anyone would nuke a city in their country. For example the expressions “the superb performance of the IDF”.. What is superb about this performance ? It is not explained and we are expected to take this at face value. Israel had barred the media from Gaza while it was conducting its campaing and has recently put together a legal team to defend against possible war crime proceedings. These are signs that the conduct of the israeli military is not beyond reproach and certainly not superb. We’d like to see some deeper and more balanced analysis than the old “israeli good guys can do no wrong vs Hamas bad guys can do no right” …. And finally the author is under the illusion that this particular issue can be resolved by force… It cannot.. Until the palestinians have real rights and a real state , violence will continue… Even if Israel somehow gets rid of Hamas, someone else , mroe radical will take its place…. In fact Israel encouraged the emrgence of Hamas thinking it was a smart move to counterbalance the Fatah (who were then considered terrorists).. Now Fatah are the good guys (not terrorists any longer?) and Hamas is a pain for its creator… It seems Israel has either not learned the lesson, or in fact, considers that a violent Hamas serves its overall political purpose. How can someone write such biased inaccurate nonsense. His analogies with world war 2 are ludicrous. What sort of humanity has Ralph Peter’s got. When he talks of ‘the superb performance of the IDF’ I can only see the dead pictures of little children. the article clearly shows the opinions of the writer. Whether I agree or not is irrelevant. Has anyone writing been under rocket fire? The rockets have been used, since the Chinese started using them first, as weapons of terror. Casualties are a much sought after side effect but not the primary one-terror is. Try to imagine the effectiveness of this when done to a civilian population fired on a random basis. Israel exited Gaza approximately 7 years ago. From that time on rockets have been fired frequently if intermittently. Israel is under no obligation to open the borders, except for humanitarian purposes, to a regime which espouse it’s destruction of not only the state of Israel but Jews in general. The numbers of rockets fired seem to approach 6,000. Most are low tech. You can see them flying. Hamas as a religious terrorist organisation has bluntly stated what it wishes to do. Simply read it’s charter. The Occupation is NOT why Hamas attacks Israel. it is not in essence a Palestinian organisation. It is a religious one. It’s final goal is not so much an independent state as one based on Sharia.Please notice it’s actions against the few Christians remaining in Gaza. It is a highly organised and intelligent enemy. It uses propagana brilliantly and plays the media like a viloin. If after the Israeli pullout Hamas had put all it’s efforts in to making life better for Gazans there would have been no sealed borders and no current conflict. They have made a choice, as it is their raison d’etre to continue the military struggle. Do not underestimate their use of civilians as shields . This is a standard tactic by non-uniformed insurgents and terrorists. In this case any civilian killed is immediately a martyr. The cease-fire was not totally followed by either side. Israel was supposed to lift the blockade (which it never did) and Hamas was supposed to stop smuggling (which it never did). But as far as overt violendce goes there is little doubt what triggered the mass of rockets that ended a shaky cease-fire – it was the Israeli November 4th raid. That links to a decidedly pro-Israeli source that someone has come up with based on news reports (both in Arab, Israeli and Western m edia) of rocket/mortar attacks placed into an easy to read calendar format. Notice the calm prior to November 4th. Also note that Hamas moved against militants firing rockets and mortars prior to Nov 4th. They have accused Fatah of trying to sabotage the cease-fire by firing mortars/rockets at Israel. It is impossible to know whether that is true but it is clear that Hamas largely kept the peace prior to the Israeli November 4 raid. More importantly, Israel, even with excessively harsh curfews and restrictions, has repeatedly failed to fully prevent violence originating from areas under their direct military control. Therefore what chance does Hamas or Fatah have when their security apparatus is constantly attacked by Israel? 1) Redeem the prestige of the IDF from the Lebanon fiasco. 2) In following #1, re-establish a credible ground-force deterrent in the region. 3) Prove that the Kadima-led coalition can be tough – important in their upcoming domestic elections as they stand to bleed votes to the further right parties who are “tough on terror”. To achieve this, Israel needed a conflict and they needed to wrap it up before Bush left office. Hamas, thoughtfully sought to block this by acutally abiding by the cease-fire (largely). It works to their advantage as well to have a long cease-fire just prior to the induction of a new US president. So Israel launched the November 4 raid on the pretense of blowing up a tunnel used for smuggling which they knew would trigger a Palestinian response. Israel would go on a PR blitz (whicih they did) and the mainstream media largely reports it as Hamas breaking the cease-fire. This is not new. Many cease-fires have been broken by both sides in the past, but the Israeli side always breaks cease-fires in that fashion. Whenever Palestinians abide by cease-fires, Israel breaks the cease-fire and blames it on the Palestinians and it works thanks to Ralph Peters and co who propagate thoroughly biased “analysis”. Israel can have peace and normalized relations with Syria at any time – all they have to do is return the Golan Heights in full. The closest thing to that ever offered was by Ehud Barack and he wanted to maintain a 100 ft strip of land around the Sea of Galilee – thus betraying that the Golan Heights (whose military significance has dimished with the SSM) is not about security but water. That is why Israel will never return the Golan in full which at present is the Syrian demand for peace (and would fulfill the Syrian portion of UN Resolution 242 calling for the withdrawal of Israeli forces from occupied territory). Water is also largely why Israel builds settlements where they do and why Israel will demand they retain some settlements. This is not a war about religion or culture. For Israel, this is a war for resources. For Palestinians, this is a war for self-determination. Even without the historical context it is easy to understand which side is in the wrong. If the translation is correct then I dont see that this sets the destruction of Israel as the goal of Hamas. It probably can be interpreted in that way but it seems that many other interpretations are possible including for example the non violent end of Israel through conversion of its inhabitants to Islam (not a likely outcome I would say). On the border issue: another poster stated that Israel has no obligations to open its borders.. That is true. Also I find it strange that the reasons behind Egyp’s closing of their border with Gaza are not often mentionned. Does anyone have information as to why and how this happened ? Presumbaly Gaza could get all it needs through Egypt. What is disturbing though is the naval blockade to which the territory is submitted. And I do not understand the israeli argument about “we will close our borders until the weapons smuggling stops”… Was there any weapons smuggling from Israel to Gaza ? how does closing the israeli border address the issue of weapons smuggling ? Translations are always more open to interpretations. As was Mein Kampf. I would suggest that the form of interpretation that Hamas has taken is shown by their actions and their words in speeches, this is the only important interpretation. “We will knock on the doors of heaven with the skulls of Jews” does not help the situation.This is just one example.Keep in mind that to an Arab these words quoted above refer to the Crusades . “eliminates” is the key word. Culturally this harkens to the days of Sal’adin. That said, Gaza is and has been a miserable place. It has been run bythe same clans for hundreds of years. Hamas has in some ways added stability to the society. It has an end game of Sha’aria in it’s Sunni form. The Israeli borders were sealed when Hamas took the area over. Egypt after it’s withdrawal in1967 has not wanted to have anything to do with Gaza. They are sworn enemies of Hamas and it’s parent the Moslem Brotherhood. The Egyptians will not open their border except under extreme circumstances. The smuggling goes on unabated from the Egyptian side. Why? it is highly profitable. The Hamas leaders can, if they wish call a “Hudna” but they will not “become policemen for Israel”. Meaning they will not stop the other factions(PFLP, JIHAD etc. ) from firing. Is Hamas the legal authority in Gaza? If they are they must abide by the obligations of the legal power. Elected by the people(I was in Gaza at the time) and I would have voted for them given the other choice. However they did not get elected to continue the armed resistance but on a promise of eliminating corruption, which to some degree theyhave AND to improve living conditions. They have not. They have also completely taken over by force all forms of power. There is no possible election now in Gaza. It is a totalitarian state. Religiously based but still totalitarian. I was first in Gaza in 1981. It is worse now. I maintain that given the Israeli withdrawal and that the power in Gaza is now in the hands of Hamas that the current situation is primarily the fault of Hamas. They have done nothing to help their own people.Their agenda is not to help the people, in my opinion. The borders would be open, the blockade lifted, Commerce begun and aid sent IF they simply stop pushing the”armed struggle”. No sovereign nation can abide the constant threat of rocket attacks. At this stage Israel is being reactive. If Hamas is legitimate let it stand by past agreements. Stop all firing and attempted kidnappings. Control the other factions too and I’m sure the Israelis will bend a lot towards a lasting peace. palestinian name from romans that was once philistines. According to Jr CHurch recent magazine the claimed Philistines were actually long dissapeared ages ago….Interesting..
maybe God has a plan ,keeping Israel out? This is a war of religion Countries have been trying to wipe out Jews for thousands of years not just Arabs Wonder why? It will get only worse for Israel all nations will be agaisnt her soon..
30% of all US military and economic aid is given to Israel. Is there any reason for this? Per capita giving to Israel exceeds $500 whereas the per capita giving to Ethiopia is a mere 45 cents. Is there any logical reason for this? Understand tht Our Leader signed an executive order that gives to the people of Gaza $200 million to repair the damages caused by Israel… guess that is OK because it was US military equipment that caused the damage. BUT the same executive order allows “X” number of people from Gaza to immigrant to the US….. is this akin to the Trojan Horse? The evidences leading to the American foreign aid are ample at your fingertips. There for, I’ll only give away a nutshell summery of the “American foreign aid” to Israel. 1. It begun in 1979, the three-way-treaty among Egypt, Israel and USA. a) compansation for Israel for losing the stratigic depth. b) Golden shekles on Israel’s limbs. Any threats on Israel’s wish list has stratigic significans on Israel. c) Giving Sinai to the Egyption, along with 1BN $US allowed Egypt to break away from it’s former USSR backing into American hagamony. d) Contorl over Israel’s technology transfare deals. Somtimes used as persue unethical trade compatition. IIsrael must only use American made products. a) Outcome of this: Israel often trasfare indigenous defese technology to America, so high cost parts or weapons can be bought using the American foreign aid money. c) Israel loses jobs in favour of American, unless we can aqueeze recipatory contracts for procuts we’ve ordered. Bottom line: 1) The foreign aid is not an act of American kindness, but a result of a signed treaty which enabled severing Egypt from Soviet sphare of influance and a elaborated truth between Israel and Egypt. 2) The foreign aid has hidden stratigic costs for Israel. 3) Israel agreed for the three way treety, because many believe it had more advantages for us then disadvantages.